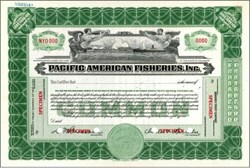 Beautifully engraved specimen certificate from the Pacific American Fisheries, Inc. printed in 1928 when the company went public. This historic document was printed by the Security Banknote Company and has an ornate border around it with a vignette of a sea port with two allegorical women around it. Pacific American Fisheries, Inc., one of the world's major salmon canning operations, operated on Puget Sound and in Alaska between 1899 and 1965, with headquarters in Bellingham, Washington. As one of the world's largest processors of Pacific salmon, PAF claimed a global market and the company had regional, national, and even international significance. PAF contributed many significant innovations to the development of the industry, including floating canneries, mechanized salmon processing, ship building, and even dabbled in the production of salmon skin leather for a brief time. As PAF flourished in the early twentieth century, the center of Pacific salmon canning moved north from the Columbia River and Puget Sound to Alaska as the company opened new canneries to exploit the untapped and less regulated resources of British Columbia and remote districts of Alaska. The company's fortunes began to fall in the 1930's with the abolition of fish traps, uncertain salmon supplies, and corportate changes that served to transfer directorial power to individuals with no ties to the fishing industry. In 1898, Count Roland Onffroy, a French immigrant, organized the Franco-American North Pacific Packing Company, a large salmon cannery on Fairhaven Harbor, South Bellingham Bay. The company ran into technical and financial difficulties during its first season. The following year, 1899, two brothers, Frank and E.B. Deming of Chicago, purchased the Franco-American plant and the Northern Fisheries plant at Anacortes, Washington. They organized these companies into the Pacific American Fisheries Company. In this same year, they purchased Eliza Island in Bellingham Bay, and built a new cannery on the site. Lack of a water supply deterred that operation, and by 1900, Eliza Island became a shipyard to build and repair smaller vessels and fishing equipment. The Demings retained Onffroy as resident manager until 1900, when E.B. Deming came to Bellingham to take over as general manager and vice-president. Onffroy, always the promoter, obtained eastern financing to organize Pacific Packing and Navigation Company (PPN) in 1901. This company consisted of more than thirty canneries on Puget Sound and in Alaska, including PAF properties. In 1903, PPN collapsed and went into receivership and Offray left the operation. In 1904, the Deming and Gould Company purchased the PAF and Northern Fisheries properties from the receiver and re-organized it into Pacific Fisheries of Maine. In 1905, PPN was dissolved, and PAF took over the remaining properties. At this point, PAF's corporate structure and management become more stable, with E.B. Deming as its president and the assistance of his brother Frank, who ran the Chicago office until his death in 1916. For the next several decades, PAF increased their holdings and expanded their territory in both Alaska and Washington. In 1906, PAF embarked on its first Alaska venture with the purchase of Alaska Fisheries Union Cannery at Chilkat Inlet, an operation that was moved to Excursion Inlet in 1908. The company tried some early product diversification with the Drayton Harbor Oyster Company, a subsidiary which operated from about 1908 through 1911. They also established the Commercial Point Shipyard on Bellingham Bay in 1916. During this period, the company rapidly expanded in Alaska, acquiring a salmon saltery at Thin Point near King Cove, Alaska, canneries at Port Moller on the Alaska Peninsula, and at Nelson Lagoon, and a small cannery at Makushin Bay near Unalaska, built at the request of the Bureau of Indian Affairs. A dramatic increase in demand for salmon during World War I led to another flurry of purchases in 1917. PAF moved into Gambier Bay, acquired the Hoonah canneries in Southeast Alaska, the Katalla Cannery at Bering River, a salmon saltery at Squaw Harbor on Unga Island, built the Ikaten cannery, which processed cod, as well as salmon, and acquired canneries at Herendeen Bay, Metlakatla, Ketchikan, and Port Walter. PAF made a brief foray into British Columbia in 1925 after the British government announced plans to limit its imports to countries within the British empire. This policy would effectively eliminate PAF's most lucrative foreign market, and to negate that threat, the American firm purchased a cannery from the Skeena River Packing Company in B.C. The British government reversed the policy and PAF exchanged the Skeena River cannery for an abandoned cannery and three good fish trap sites at Point Roberts, WA. To finance another major Alaska expansion, the company went public and listed its stock on the New York Stock Exchange in 1928 reorganized the company as Pacific American Fisheries Inc. under the laws of Delaware. In 1935, the company floated another major stock issue to complete its Alaska expansion, and acquired canneries at Nushagak, Naknek, Alitak, Zachar Bay, and Petersburg. These properties supplemented a lease agreement with the bankrupt Northwestern Fisheries company which provided an option to buy thirteen additional Alaska properties. The acquisition of these properties was completed in 1935. The 1930s brought about other changes at PAF. In 1932, E.B. Deming the company president and sometime treasurer, became chariman of the board, and Archie Shiels became PAF's new president and treasurer. Shiels had been a vice-president since 1924 and treasurer since 1928. Two years later, in 1934, the aging Deming sold his controlling interest in PAF to the Chicago Corporation, a syndicate of Eastern financiers. In 1935, the Demings sold their controlling interest in Deming and Gould to PAF, and it the original company became a wholly-owned subsidiary and PAF operated for the first time without Deming family involvement. Also, by 1935, the Bellingham cannery, warehouses, docks, office building and other facilities were incorporated into a subsidiary known as Bellingham Warehouse Company. The end of the 1930s saw the closure of the Eliza Island Shipyard when the small boat unit was moved to the Commercial Point Shipyard, which had undergone an expansion. This shipyard was used during both world wars to produce military vessels for the U.S. war effort. A restructuring of the company in 1939, placed an executive committee of the board of directors in charge of management, and thereby diminished the control of the operating officers. By 1946, when John A. Green became the president of PAF, the board of directors was dominated by financiers and businessmen from San Francisco, Seattle, Alaska, and the East. The new directors had no direct connections with the salmon canning business. The need for support services and product diversification resulted in the creation of several new subsidiaries. Most notable was the research division. Though research was conducted at PAF prior to 1944, it officially became its own department and in 1950, was incorporated into a subsidiary, Pacific Laboratories, Inc. to handle the company's patents and trademarks. Seeking further diversification, PAF acquired controlling interest in Cedargreen Frozen Pack Corporation, which had farms and plants in the Seattle area and eastern Washington to produce and pack berries and vegetables. This operation, never very profitable, was phased out in 1961-62. In 1956, Alaska outlawed salmon traps in Alaska waters. It was the elimination of the fish traps that signified the end of PAF which could not absorb the increased cost associated with a seine and gill net fishery. In the fall of 1956, the company attempted to further diversify by going into the king crab business, but failed to generate enough profit to maintain operations. Also during this period, Stanley G. Tarrant took over the PAF presidency in 1956 from Edward A. Wilke and remained its president until the company closed in 1965. By 1965, the PAF board was dominated by non-cannery people who were not accustomed to the cyclical and unpredictable nature of the salmon canning business. These interests took advantage of the opportunity to sell off assets and realize $30 per share of stock, most of which had been purchased at $10 per share. A few company personnel remained for a time to sell off canneries and other assets, including the Bellingham property which was sold to the Port of Bellingham in 1966, and later became the site of the Alaska Ferry Terminal. The sale of the Pacific American marked the passing of an era and the end of an industry which witnessed an immense amount of history and served to helped to define the character of the region.